My April GlossyBox has arrived. 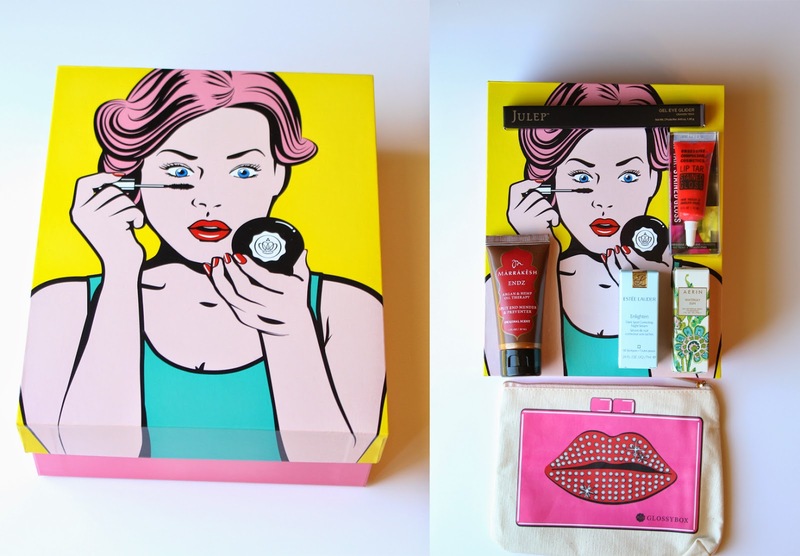 This months box is very fun, I love the Pop art/Comic look. I thinks it's one of the best designs they've done yet. It includes 5 products and a makeup pouch. I was looking a bit more forward to the pouch. I feel like the iron on transfer isn't very nice and mine is messed up on the back a little. Still nice touch though. Sadly this will be the last for awhile, I just can't justify the money right now. But hopefully they will be back again soon in my mail box. This is a nice box. Really nothing bad to say about it. I even like the cute little perfume. I normally don't like getting perfume but don't mind if they come in cute little bottles, I hate getting the little perfume tubes. If the Marrakesh Endz: Split End Mender & Preventer is any good I might give it a review. It looks like it might be a very nice product if it works. Also the gel liner looks very pretty. I'm a big eye liner junkie so I can't wait to try it. Are you a Glossy Box subscriber? I'd love to hear your thoughts on this months box, What was your favorite? If you'd like to try any of the products just click on the name and it will take you to where you can buy it online.